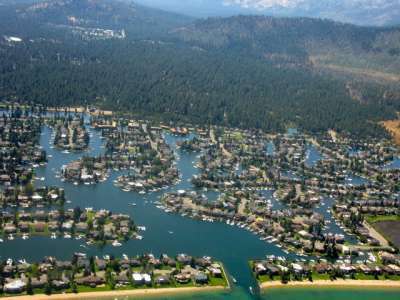 The Tahoe Keys is located within a 740 acre area it is Lake Tahoe’s premier marina based community. There are over 1,539 home, condos, private lots, and homeowners located in this community. The Tahoe Keys are located at the southern tip of Lake Tahoe in South Lake Tahoe city limits. Most of the property owners in the Keys have their own private boat dock located in the many canals, lagoons, and the Tahoe Keys Marina located within this neighborhood. The Tahoe keys offers breathtaking Lake Tahoe and mountain or meadow views, a truly magical spot for anyone who enjoys the outdoors and of course boat and water enthusiasts. The Tahoe Keys has quite a few amenities for their owners including indoor pool, private beach access, tennis and basketball courts, spa and more. The Tahoe keys Marina offers fabulous dining at the Fresh Ketch restaurant and boat launch for those who just want to come for the weekend as well. The homes in the keys very dramatically in the architecture compared to most homes in South Lake Tahoe. The home values in the Tahoe Keys certainly hold their value more so than some other neighborhoods. The homes here seem to stand on their own and offer a wonderful vacation rental or long term investment. For more information about homes in Tahoe Keys please contact me today.